This week on #MeetAScientist, get to know Dr. Beau Wangtrakuldee, a medicinal chemist and founder of AmorSui, a clothing apparel line for women scientists. Beau shares how she was inspired to start the line with evidence-based design practices and what drives the work she does today. I was a very stubborn young girl. I had trouble getting good grades in school when I was younger because I didn’t like following rules. Being told what to read or given assignments to complete were not my thing. It is good that I grew out of that because if I didn’t pay attention in high school, I would never discover my fascination with chemistry. I love that in many ways, it is the strength between bonds of small atoms and molecules that make up the hardest elements on Earth. After high school in my native Thailand, I received an academic scholarship to further my study in the US. I rotated between a few different labs for summer internships and fell in love with organic synthesis, which had led me to pursue medicinal chemistry in graduate school. Currently, I am no longer working at the laboratory bench. I advise biotech companies on how to grow their businesses from the perspectives of talent and human resources. My last role in a research setting was as a Postdoc researcher at Penn’s Perelman School of Medicine. I led a discovery project for new treatments for prostate cancer. You have recently launched a new line of apparel for women scientists - AmorSui. Tell us how you came to this, when you launched, what inspired you? Although there has been a significant increase in laboratory safety standards, 40,000 cases related to exposure to harmful substances, fire and explosions are reported in the US every year. I founded AmorSui because my product helps mitigate the challenges that are essential in making more effective safety compliance for scientists, especially women. What first started as a personal quest to find personal protective equipment (PPE) to protect myself after suffering a chemical burn from a lab spill four years ago (despite being properly dressed with a lab coat on) turned into a dedication to finding a solution for 1.3 million female scientists all over the world. This is because I found that protective clothing made for women does not exist, and a lab coat is not always enough as I learned from my own experience. AmorSui is the first professional apparel brand with a mission to protect and empower female scientists. My team created a new approach to chemical safety and promoting compliance by offering well-fitted and stylishly-made protective clothing that women scientists want to wear, with or without a lab coat. What articles do you feature? What does it mean 'designed with women scientists in mind’? What is your favorite and what plans do you have for the future? Although I am confident that I have a clear perspective of what fits the needs of women scientists in the lab, I want AmorSui’s pieces to be as inclusive to all fields of women in STEM as possible. Each garment from our collection is designed based on collective insights from 100 women scientists from different backgrounds to suit the functions of their day to day work. The result is two apparel lines for women scientists—the chemical- and fire-resistant Chimie line for chemists, which we launched on iFundWomen in August, and the stain-resistant Bioleta line for biologists, biochemists, and medical professionals, which is currently in development and will launch next spring. In general, all AmorSui garments feature protective properties, comfort, and professional aesthetic. “AmorSui” in Latin means “self-love”, as female scientists wear our garments to protect themselves while feeling confident and beautiful. We design our pieces for every brilliant woman in STEM that could go on to discover the next big thing, knowing there is nothing that can get in their way. My team is currently raising funds on iFundWomen to launch selected pieces from the Chimie line, which will be available for an early bird discount until November. 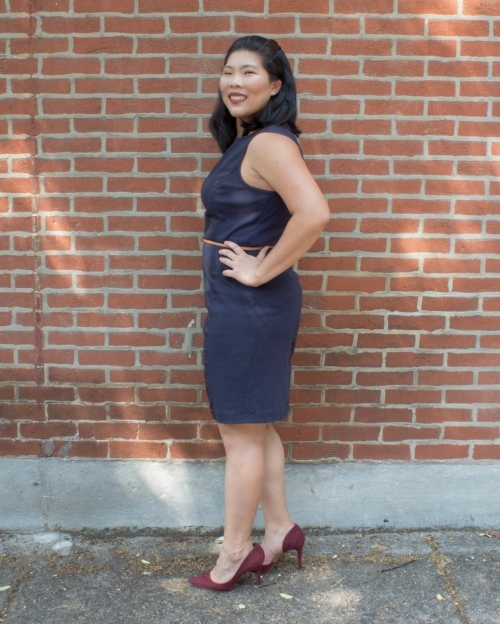 My favorite piece is the Marie Curie dress, a classic navy dress that is incredibly versatile. I have been having so much fun figuring out different ways to layer this dress transitioning from summer to fall. Check out AmorSui’s IG @amorsuiclothing to see all of my #ootd posts with the Marie. It’s difficult to understand how hard it is to produce clothing until you get into the business of making clothes. I am so happy to find a family-owned garment factory with over 20 years of experience to partner with for my first production. We are in the process of finalizing a production schedule and will begin manufacturing product by the end of October. In addition to manufacturing our product, AmorSui is fostering relationships with influencers, organizations (wave to 500 Women Scientists! ), and hosting pop-up shops in our home city of Philadelphia in the fall to increase our brand awareness. In addition, our team is putting together a business plan with prototypes to pitch to research centers and industrial companies to establish long-term partnerships. Our first company presentation will be at Life Science PA Future conference at the end of October at the Philadelphia Convention Center. Beau wearing the Marie Curie dress from AmorSui’s Chimie collection. This is a wonderful way to combine science and art. How do you see this have an impact on the broader science community? I am glad you asked. I believe AmorSui’s mission and the 500 Women Scientists’ are aligned, as I want to build AmorSui to be a force that advocates and empowers women in STEM. Last week, Frances Arnold was awarded the Nobel Prize in Chemistry. She is the fifth woman to be recognized for this accomplishment and only one in 17 women who have ever won Nobel Prizes in STEM fields, representing only 3% of the total awardees. Many people have claimed that this is the era that diversity will finally improve, but the truth is that we are far from that. We, as women, fail to reach leadership positions due to social and professional discrimination. I woke up today in a world where these challenges preventing us from moving up are obviously still present, given what I have seen in this political climate. That is why I created AmorSui as a change to advocate and empower women in STEM, by providing both physical and community support that will help women scientists grow and prosper. Perhaps the most important question we ask of all, when you're not science-ing, doing outreach, or designing, what do you do to unwind? I enjoy competitive tennis in my free time, and play in USTA leagues around Philadelphia. I find true joy in hitting tennis balls and screaming now and then. Who wouldn’t? Beau Wangtrakuldee is a senior associate in Korn Ferry’s biotechnology practice, providing growth strategies through leadership/executive searches for venture-backed, high-growth companies with novel technologies that benefit patients. Prior to Korn Ferry, she served as a postdoctoral researcher in the lab of Dr. Trevor M. Penning at the Perelman University of Pennsylvania Medical School, leading R&D efforts for new prostate cancer therapies. In addition to her R&D background, Beau has experience with consulting and intellectual property from multiple roles at Wharton Penn Biotech consulting group (PBG) and Penn Center for Innovation (PCI). Beau received her BA in Biochemistry from Kalamazoo College, MI, and her PhD and MS in Chemistry from Northern Illinois University. She is a recipient of the 2016 Young Investigator Award in Enzymology and the 2013 ACS-Younger Chemists Committee Leadership development award.